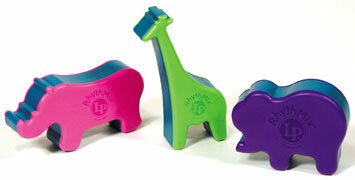 Everyone knows that children love animals and that's why LP created the RhythMix Animal Shakers! Children will be delighted to get their little hands on these three jolly animals! In addition to their great sound and sunny colors, their easy to hold shapes make them ideal for children, who will love using them to accompany their favorite songs or to create their own lively rhythms. The 3-piece assortment is packaged to include three shakers with a musical activity booklet.